June 20th. Dawn Patrol out of Grand Junction. Up at 4.30 a.m. and away by 5.15 to avoid the heat of the day. Along I. 70 we cross the border into Utah, pass a sign saying Rabbit valley, and immediately after a sign to the Dinosaur trail. Bugs bunny 1 - Dinosaurs nil. We are travelling through a lunar landscape, desert to left and right with amazing rock formations in the distance. another sign says 'eagles on the highway' . Peter drives the first 100 miles in the awakening dawn to Green River. There we pause for a light breakfast. I take over and we branch off onto Rt 191 North. Another long stretch of desert, no sign of life, either human or animal. After a town called Price, the drive becomes more interesting as scrub and then sparse trees appear. We climb up to cross an escarpment, the road wends through a ravine with trees now covering the slopes. It is rather reminiscent of parts of Greece. The temperature cools as we climb to reach 7,422 feet at Soldiers Summit. The descent into the next valley is like a Giant slalom course, lovely long sweeping turns. We pause at Springville on Lake Utah and Peter takes over again for the last section. A short drive round Lake Utah past Cedar Ford, new houses all with the horse in the back yard. We arrive in Tooele in time to enjoy the day as holiday -makers. First put the laundry on, we are all running out of socks, then on into the swimming pool. This is a good time for some trivia. The picture, brilliantly executed by Lawrence, is of me driving past a truck. At this point there is a State Trooper stopping someone on the hard shoulder that you can't see. Well, neither did I and a few minutes later I get flagged down by this gun-toting sherriff who wants to know what I thought I was doing passing while he was apprehending someone else. My British driving licence slows his tirade and I humbly apologise and say I was so sorry but was unsighted by the truck. Meanwhile Peter is trying to kick me for argueing ( that is a little bit difficult in a HEALEY - I mean the kicking bit ) but my charm sways the day and I get off with a warning. I think he really wanted to see the car because after that, he mellowed a lot and started asking us all about where we were from and where were we going? Lie in this morning - not away until 7.30 a.m. I drive the first section along I. 80, skirting the Southern edge of the Great Salt Lake. We cross the Salt Flat desert for about 80 miles, you could drop Scotland into it and lose it. At Wendover a short 5 mile road leads back into the salt flat and comes to a dead end. This is the site where so many land speed records have been broken, in particular one by Donald Healey in the 50's, when he drove a modified Healey at over 200 miles per hour. All the guys pay tribute and Julian is determined to break a new record. Unfortunately we forget to start the clock ticking. A quick hop takes us to the old Wendover airport. This used to be a military base during World War 11. The USAF bomber "Enola Gay" carrying the first atom bomb to be dropped on Japan was based here. It is now deserted and used as a racetrack. Four Austin Healeys were allowed the privilege of two laps of the track before the day's racing begins, after signing a disclaimer. These are Julian Bowen, Peter Hunt, Bob Brown and Bill & Gordan, alias Wallace and Grommett Mark II in the Bugeye. ( Mark I drove the Lagonda on ATW.) The pace car is a Lotus 11, the fastest 11,00 cc car ever made. It goes rather slow on the first lap as it isn't sure what Healeys can do. After Julian has sat up its exhaust it speeds up for the second lap and gives them something to think about. Great fun is had by all. On to Ely across another 120 miles of nothing, over the White Horse pass, 6046 feet This was the old Pony Express route. One can imagine what it was like as it hasn't changed in a hundred years. Nothing in every direction except majestic vistas. 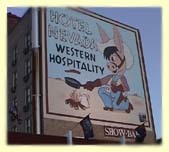 Into Ely, Nevada, to an old gambling Hotel. The cheapest room yet and by far the most interesting and attractive. 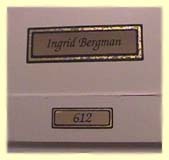 We are in Ingrid Bergman's room. The walls are festooned with portraits of her in different films, the chandelier, lace curtains, little touches making it so homely. A short interlude at the shooting range up in the hills provides some light relief from driving. One of the Healey drivers, John, has brought his rifle so he and Peter test their skills. They encourage me to have a try. On the first attempt I score two bull's eyes, beginner's luck. Four rounds later they are getting better and I am deteriorating . One should always quit when ahead, just like gambling. Up at 3.00a.m. to leave at 5.00 !!! Peter has forgotten to change his watch again. Go back to bed. Set off at 5.20 - quite cold, jackets on. We traverse a series of valleys and passes. I take down all the names. This stretch of ROUTE 50 is the old Pony Express Trail and is known as the loneliest road in America. I can see why. Don't worry, we have our survival kit with us. After 57 miles we see one farm steading. We spot a 'ranch for sale' notice. Tempting. Into Eureka and a short stop for breakfast. This is an old mining town that once supported 11,000 people. Now there are about 1,500. Some of the old buildings remain. We pass the sand mountain- 2 miles long and 1 mile wide. After 250 miles of nothing but arid valleys and mountain passes we come to a wider valley with the River Carson marked on the map. Here lies Fallon, more evidence of agriculture, dairy, beef lots , the best water melons, irrigation. People cannot survive without water. Also the home of the US Navy's "Top Gun" training base. 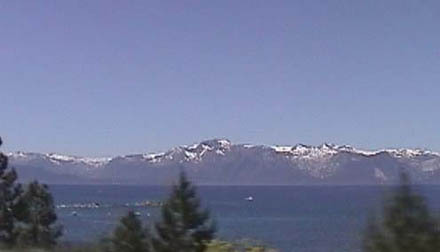 Onto Carson city then over a stunning last Pass - Spooner - with lots of trees and get our first glimpse of Lake Tahoe, unimaginably beautiful. Philip and Kathryn are there to greet us having flown in from Scotland to Reno then hired a car.